I feel like it is fair to the rest of the people at UConn's football press conference to let it be known that I am the one who asked - or started to ask - the question about mid-season coaching changes to Randy Edsall. First, I think suggesting that Edsall cut short the press conference is not entirely accurate. I waited until I believed that my fellow reporters had asked what they needed to before springing that question on Edsall because I've been on the other side of needing to get a question or two asked only to have the media access abruptly ended. I would never want to ask a question that I knew might cause a reaction similar to what happened today until I believed my colleagues were able to get what they needed out of the media availability. My intention was to follow up my initial question with an inquiry about whether he feels any changes needed to be made or at least considered. It is not me suggesting that defensive coordinator Bill Crocker be fired. I believe the opposite. With so many young players, UConn needs as many coaches as possible working with them. I've seen position coaches shuffled around at UConn in recent years and felt that it was a fair question to see whether there might be some juggling of responsibilities or whether Edsall would spend more time with a particular position group than he typically does. This is relevant because at the last couple of practices I have been at, I have seen him over with the defensive backs more than usual. I've also noticed that in recent weeks a graduate assistant has been working with the Husky backs (a safety/linebacker hybrid) allowing Crocker and defensive backs coach Curome Cox more time to work with a smaller group of DBs. I never got that far. I have some concerns about how things have transpired on defense this season and asked questions (not ones that generated as much hoopla) about these issues. It's troubling to see Darrian Beavers go through all of spring and summer camp at linebacker before the coaches decide he should play defensive end. It's odd to me that Kevin Murphy, one of the few experienced players on defense and somebody who was pushing NFL rookie Foley Fatukasi for playing time last season, went from starting against URI to playing only the final three snaps against Syracuse a week later. Now he is not even a player Edsall mentions as being a part of the eight-man defensive line rotation. I believe decisions like these are contributing to some of the defensive struggles. It's hard to develop defensive continuity if you start 22 players in four games. I also feel like UConn should have done what it could to get Brice McAllister back for another season. I'm not suggesting that he would solve all the issues facing the secondary but he is an experienced defensive back with the athleticism to play a few different positions. Even if he wasn't playing a huge role, he seems more comfortable in a leadership role than sophomore Tahj Herring-Wilson, who is a great kid but a little on the quiet side. You can look back at my work this season and nobody has addressed the number of untested players being thrown in there on defense. I've gone through every FBS set of game notes to document the number of freshman starters on more than one occasion. UConn opened the season with an almost impossible task of trying to slow down the experienced and dynamic UCF, Boise State and Syracuse offenses with a bunch of true freshmen, redshirt freshmen and true sophomores and I understand this better than most people. I dove a little deeper into how UConn got into this situation in the story running in tomorrow's paper taking a look back at how much of an impact that the firing of Paul Pasqualoni had on recruiting. It just so happens that the fifth year anniversary of that firing is Sunday. It can be debated for years to come whether the firing of Pasqualoni during the season was the right move at the time but this much is certain, it wreaked havoc on recruiting. UConn's last commitment before Pasqualoni's firing came on Aug. 8. The next time a high school player committed to UConn was Jan. 20. During that same time span the eight American Athletic Conference teams on UConn's schedule this season received 59 commitments and many of them will play significant roles in games against the Huskies this season. I'm not somebody who asks questions so the response can be plastered all over the internet or on social media but with the defense on pace to top the marks for most points and yards allowed (according to the 2018 FBS record book posted on the NCAA site) and the anniversary of UConn's last mid-season coaching change quickly approaching, I felt it was an appropriate time to ask the question. I would have preferred Edsall to allow me to complete my line of questioning which would have given him a chance to vouch for his defensive coaching staff who clearly have quite the task ahead of them. Unfortunately that did not happen. Rather than bothering the other UConn beat writers about the phrasing or fairness of the question I started to pose, it seemed like the right thing to do for me to write this blog so if you feel a need to vent on what has been referred to as a stupid question that it gets directed to the person responsible. I'm not looking for other media outlets to reach out to me because stirring the pot just for the sake of stirring the pot is not my style, never has been and never will be. I'm also not going to hold back when I feel like it is an appropriate time to push for answers on a subject. I haven't posted on this blog for quite a while because quite simply, it wasn't generating enough interest to keep it going and doubt I will be posting on it in the future but I don't know of another way to get this message out there. If you have a need to respond to me, my email is James.Fuller@hearstmediact.com. I'd rather you not post comments to the blog because another person is responsible for approving them and he doesn't need to be thrown into this. Perhaps if the Huskies had been playing a quarterback not named Quinton Flowers, the 24 players honored before their final game at Rentschler Field would have left their home away from home with a victory to celebrate. However, Flowers racked up a South Florida program record 516 yards of total offense. It was the sixth most by an FBS player this season and fourth most in American Athletic Conference history. Still, there were plays that the seniors will get to remember for the rest of their lives. 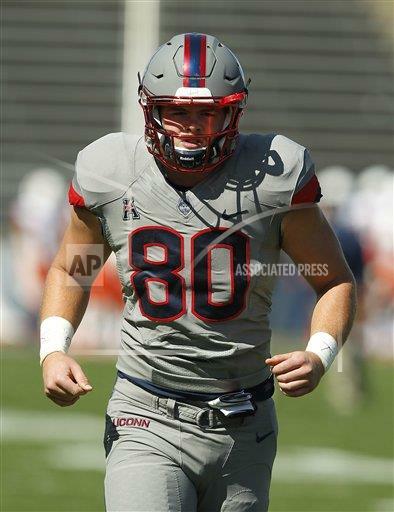 Tight end Tommy Myers isn't targeted often in UConn's offense and perhaps that was why no USF defender paid attention to him on a 4th and goal play that resulted in the first of UConn's three touchdowns. UConn's final defensive play was capped by a hustling Vontae Diggs knocking the ball out of Darius Tice's hands. The ball hit in the end zone and then caromed out of bounds giving the ball back to the Huskies and preventing another touchdown by the Bulls. Junior Joseph finished with nine tackles giving him 295 in his career. He moved by Abbott Burrell, Mark Michaels and Uyi Osunde and into 15th place on UConn's career tackles list. He's got some work to do to move up even further as next up is Brad Keatley's 311 tackles. Joseph reflected on the day's festivities and his run at UConn following the game. "I've played with a lot of guys and have seen their senior days and different guys that I have played with since I have been here and it is special," said Joseph, who made his 37th career start matching the UConn record for a defensive player set by Dwayne Gratz and also accomplished by Jhavon Williams. "It is kind of surreal that it is my last time in this stadium all the memories I made with guys like Byron, Andrew, Obi guys who are in the NFL and it is a privilege playing with those guys and playing my last game here is surreal. I soaked it in before the game, just tried to focus on the game." It's been a tough year injury wise for the senior class as running back Arkeel Newsome, linebacker E.J. Levenberry and safety Brice McAllister were unable to play. Quarterback Bryant Shirreffs and running back Jason Thompson were knocked out of the game with concussions. With UConn's home game against Boston College on Nov. 18 at Fenway Park, there will be no more Rentschler Field experiences for the senior class. Now the goal is to avoid making the wrong kind of history. UConn came into the season with six straight losing seasons, the longest streak in program history. It was first accomplished from 1930-35, again from 1974-79. One more loss would make it a program record seven straight losing campaigns and next up is undefeated UCF on the road. In the last four seasons, UConn has lost 32 games which is tied for the third most in a four-year span at UConn. If the Huskies lose their final three games, it will match the record for losses in a four-year run set two years ago. Speaking of unwanted history, Marquez Valdes-Scantling's 95-yard touchdown reception is the longest given up by UConn during the FBS era. It's been reported Tres Moses of Rutgers' 87-yard TD catch in 2004 was the record but that is not true. Actually it isn't even the longest play by a Rutger receiver against UConn as in 2011 Brandon Coleman went 94 yards for a touchdown. If anybody is wondering, the 95-yard catch and run is the longest offensive TD by a UConn opponent since New Hampshire's Jerry Azumah had a 96 yard scoring run in 1996. It wasn't all bad news. Quayvon Skanes had 172 yards on kickoff returns, the most by a UConn player since Tyvon Branch's 184 yards against Rutgers in 2007. Speaking of Skanes, he also had two catches giving him 30 this season. That is a program record for freshman as Kashif Moore had 27 receptions in 2008. With Keyion Dixon now at 20 receptions, it marks the first time since 2002 that more than one UConn freshman has 20 catches. Terry Caulley, Jason Williams and Brandon Young all topped the 20-catch plateau that season. With Kevin Mensah getting the start at tailback, six true freshmen have started on offense or defense which is a program record. Mensah finished with 95 yards rushing including a 23-yard TD run. He did a much better job running up the field after having too many East-West type runs in recent weeks. "You never go East-West," Mensah said. "He (running backs coach Terry Richardson) tells me to hit the hole and go, get as much yardage as I could. He has been telling me to relax, I am a (perfectionist). He tells me that can't happen, he said I have to be patient, being in your comfort zone and be relaxed. When that comes all together, you play your best." It's very possible that UConn could be without Newsome, Thompson and Nate Hopkins against UCF meaning an even bigger workload for Mensah. Seeing Thompson on the sideline and unable to return to the game hit Mensah pretty hard. "He is my roommate so everything he does I follow because he works so hard, being a walk-on and getting a scholarship, you can tell he loves this games and he wants to be on the field. Him not being on the field hurts all of us." It was a foregone conclusion that a running back from the Valley would be taking part in UConn's Senior Day festivities. Now there will be two backs from one of the most talent rich part of Connecticut being honored on Saturday. 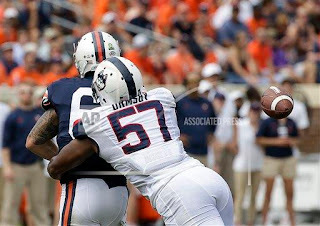 Arkeel Newsome, who rewrote the Connecticut High School football record books during his unforgettable four-year run at Ansonia High, won't be able to play against USF due to the upper-body injury he suffered in a recent win over Tulsa. Shelton High graduate Jason Thompson is one of four players listed as a junior who will be taking part in Senior Day festivities. With injuries to Newsome and leading rusher Nate Hopkins, Thompson could get more offensive touches than at any other point in his career. "Obviously I'm excited for a great opportunity, my last time playing at Rentschler," Thompson said. "I've been looking up at that since I was a little kid always wanting to play there but I am going to take it all in but it is not going to change my performance. My parents told me to take a step back, make sure you enjoy it all so I am going to do that but it is not going to change the preparation." Thompson joins quarterback Brad Westmark, offensive lineman Dan Oak and defensive back Anthony Watkins as the juniors who will not be returning to the team next season. There are times when coaches "strongly encourage" fourth-year juniors to exit stage right opening up more scholarship in the next recruiting class. It's uncertain whether than happened with any of the players mentioned above but it most certainly is not the case with Thompson who would have to be considered one of Edsall's favorite players on this year's team. Thompson is the only player to be named a game captain three times this season and it didn't take much prodding for Edsall to rave about Thompson's attitude and work ethic. "I love being around that kid, that kid there is something special," Edsall said. "You could see how hard of a worker he is and how much pride he had in doing things the right way. His position group selected him as the leader of that group. When you watch the kid go out and practice and he just goes hard every play, gives everything he has whether it is practice or the game, that is what you want for everybody. He sets a great example for not only his position group but his unit and for his team. "Earlier this season he ended up having to go down and do some work on the scout team, he just went and did his job but still prepared to go in and play. That is a guy, you can depend on, he is reliable. He is going to be very successful at whatever he does. He goes in there and has productivity when he is in there, we put him on special teams because we knew he was going to get the job done. He is a really good kid, he is a good leader, has his priorities in line and gives it everything he has each and every day. He's been a joy to be around, to me he is one of those special type of young men, he's got everything that you are looking for." Thompson, who came to UConn as a non-scholarship player, has done the work in the classroom as well. He is on pace to graduate at the end of the semester and his future plans won't include playing football. "(He's pursuing a) doctor of physical therapy degree and that could be at any school so with that in consideration, just focus on my future and that profession, I felt like it was best for me to make this my senior year, go into that graduate (school) without football being there because I don't know if it is even possible to do both." Thompson has seen more and more time on the field with each passing year. He's been a standout in the spring games and this year is a mainstay on special teams. He is the guy sent back to be the voice of reason when freshmen Quayvon Skanes or Jordan Swann field kickoffs. When Thompson believes it is in the team's best interest for them to settle for the touchback, they quickly oblige. Thompson would love to have all the running backs healthy and available to play but with that not being the case, he's going to be ready when his number is called. "I am going to do what I can with my extra opportunities to help this team win," Thompson said. 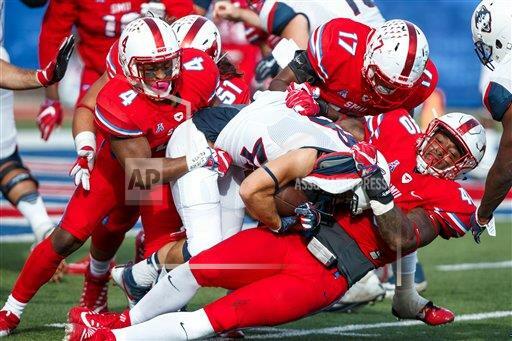 Mensah leads all healthy UConn running backs with 274 rushing yards and Thompson is considered to be the team's best blocking running back. What surprised me was when Edsall said that Donevin O'Reilly will serve as the No. 3 tailback. I figured Ja'Kevious Vickers, a redshirt freshman on scholarship, would have that role or perhaps Donovan Williams might get some reps at running back since the converted quarterback is buried a bit on depth chart at receiver. O'Reilly was one of four players who recently were added to the roster after attending a tryout for walk-ons. Edsall said O'Reilly only became eligible on Friday and now he has moved past a scholarship running back who looked pretty good at the practices I attended last year (this year's practices are closed to the print media). Naturally, I asked Edsall what Vickers' status was because if he can't get into the mix this week, when is that going to happen? "In the NFL, a guy comes onto the practice squad, he doesn't get it done, he's not working hard guess what he gets cut and you bring another guy in. I can't do that, sometimes I wish I could. I wish there was a waiver wire but you can't do that. If I am true to the team and true to the word that I tell those guys, guys who work the hardest, I don't care freshman, sophomore, junior or senior, scholarship/non-scholarship, if I stand up in front of them and say things to them and I don't follow through than I am not doing right for those kids. He has earned that right to be up over the other guy. "The same thing in terms of Tyraiq (Beals) and Keyion (Dixon), Tyraiq has earned that right. He didn't pout, he just kept working, maybe the other guy didn't work as hard or wasn't as productive. To get that culture established, that is the way we have to do it and that is the way it is always going to be done. Play the guys who give the effort, guys who deserve it and show that they want to be out there and give everything they are going to give each and every day because that is the only way you are going to get better." SUMMERS OUT FOR FIRST THREE QUARTERSThe good news is that senior cornerback Jamar Summers was on the two-deep chart which I wasn't sure was going to be the case after Edsall vanquished Summers to the locker room after he threw the ball at a Missouri receiver after making an interception late in the third quarter of the Missouri loss. Edsall, with input from the 10-member leadership council, has decided that Summers won't be able to play in the first three quarters against USF. "You know things are going to way you want them to go because I sat down with our leadership council and talked to them about the situation that took place, what they thought we needed to do as a team and as a program regarding that situation," Edsall said. "I was very impressed with the feedback and response I got back from those nine young men. They felt there was a component that needed to be dealt with away from the playing field, if there was going to be playing time taken away or not so they set that themselves. I won't get into what they set but it was a pretty harsh punishment, I shouldn't say punishment, discipline they put in place for Jamar to fulfill. They felt there should also be game time taken away. I asked them to give me parameters for what they thought would be fair in terms of the situation that happened. "I got a range of things in term of half game to a full game to maybe a quarter that they brought up. Each young man had an opportunity to express himself. As I sat back and listened, I told them I would make the final decision based on the recommendations that you guys put out there. I told them it could be the low end, it could be the high end, it could be somewhere in the middle. I made the decision, I brought the leadership council in with Jamar and told them what I was going to do so Jamar could hear it front of his teammates who are the leaders of this team and told him he will not be able to play in the first three quarters of this game which would really end up being a full game suspension based on a quarter last game and three quarters this game. Tre Bell will start and if he is playing well, doing what he is needing to do I'm not going to make any substitution there. "I am proud of those guys for the way that they handled it and what they felt was necessary in order for our program moving forward in terms of what they want to establish from a culture and what I wanted to establish from a culture standpoint."